Once upon a time, Hudson Avery knew exactly what her future looked like. Then a betrayal changed her life and knocked her figure skating dreams to the ground. Now she’s a girl who doesn’t believe in second chances, a girl who stays under the radar by baking cupcakes at her mom’s diner and obsessing over what might have been. So when things start looking up and she has another shot at her skating dreams, Hudson is equal parts hopeful and terrified. Of course, this is also the moment a cute, sweet hockey player walks into her life—and starts serving up some seriously mixed signals. She’s got a lot on her plate, and for a girl who’s been burned before, risking it all is easier said than done. I'm a huge Sarah Ockler fangirl, and while Bittersweet wasn't as heartwrenching as her previous books, it was adorable and moving and a lot of fun. As someone who has never seen snow before, reading a book about ice skating and winter and snow and all of that fun wintery stuff was so awesome. I wanted to be in Watonka with Hudson and Bug and drinking hot chocolate and eating the weirdest yet most delicious sounding cupcakes ever. As for the characters in Bittersweet, I loved Hudson, but she did drive me crazy at some points. She would not make up her mind! Of course, you know, not that I'm able to make up my mind ever, but I did want to shake her and give her a little push in the right directions. But I loved her character growth throughout the book. I thought it was very well done and I was very happy with her decisions at the end. And the boy thing. There were a lot of awesome boys in this book, from the hockey team to Josh and Will, but my favourite was Bug. He was the cutest, most awesome little brother ever. He had the greatest quirks and I just wanted to make him my little brother. He rocked. The secondary characters in Bittersweet were all pretty amazing and three dimensional, but he was absolutely my favourite. And I have to make a quick mention of the chapter headings - they are CUPCAKE RECIPES. I seriously need to try to make every single one. Overall, I loved Bittersweet so much. There's romance and cupcakes and ice skating and it told a really great and moving story about family struggling in their own ways. If you love contemporaries, I definitely recommend Bittersweet by Sarah Ockler. 4.0 out of 5 starsA very cute story. Very enjoyable read! 3.5 stars, would have been 4 stars but the technical figure skating mistakes were just too much. 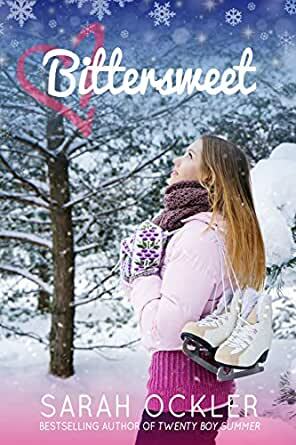 Bittersweet takes us into the life of Hudson Avery, former figure skater and current Cupcake Queen. She lives in a small town and is bursting to get out and explore the world. But what is she willing to sacrifice and who is she willing to push out of her life to make her dreams come true? And are they really her dreams or is she feeling nostalgic for her seemingly perfect past? My first Sarah Ockler book! I have Twenty Boy Summer on my bookshelf but haven't read it and after reading Bittersweet, I bought Fixing Delilah for my kindle. I love Sarah's writing style. It was like the words came off the pages and enveloped me. And oh my goodness, the description of the cupcakes at the beginning of each chapter made me crave cupcakes like no other! Now on to the actual book part! :) I really really enjoyed getting to know Hudson. She was a little selfish, but hey, what 16 year old girl isn't? Am I right? There were times when I wanted to wring her neck and other times when I just felt so bad for her and wanted to tell everyone else to JUST BACK OFF and let her be a teenager! I couldn't imagine trying to juggle all of the things that she does. There's a bit of a love triangle, but I was okay with it. Mainly because I could see how it was a natural part of the plot. It didn't feel forced and worked well. Now. I will say that I had one huge huge huge huge huge problem with the book. The technical aspect of the figure skating was just so wrong. Soooo wrong. Ms. Ockler states in her Acknowledgement that there were probably some technical mistakes and she apologizes for them but still. To an untrained eye, I'm sure that the mistakes would have gone unnoticed - ignorance is bliss and all that jazz - but for this former figure skater (me), there were mistakes that I just could not believe! Some of the things mentioned are open for interpretation for instance, what order a skater would put her jumps in her program (a triple/triple would almost always be first..rarely second), but others are just frankly impossible - a double axel/double lutz combination is not even physically possible - it can not be done! This paragraph makes me sound like I didn't enjoy the book, but the truth is even with its blatant blunders staring me in the face, I actually really liked the book as a whole. If it weren't for the technical mistakes, I would have easily given this book 4 stars. What do you think? Am I being over-critical? I hope not. I have a feeling that Bittersweet will be one of those books that people read in very different ways. Some will read it as a "cute" book with a cupcake theme, some with grasp onto the sports themes or the small town story, while others will see it more as a divorce novel. It certainly took me by surprise--I loved Sarah Ockler's other books, but since most of the early reviews I'd read of this one had focused on the cupcake/bakery theme, I was expecting something less emotional--Bittersweet has a lot of depth and it really surprised me. -It's quietly a sports novel--and handles the sports stuff so much better than most of the YA novels I've read that are marketed as sports stories. "Somewhere in the distance, the Erie Atlantic whistles again, fairy godmother lamplight glowing on the tracks, the fleeting call of that old night bird echoing through the icy air as it finally exits the station. For as long as I live in this crazy, lake-effect, chicken-wing-capital-of-the-world town, that old train howling up at the moon will always be the sound of someone leaving, the promise of another place." -The secondary characters were fabulous. This is one of those things that makes Sarah Ockler stand out. In this novel, Dani (best friend), Will and Josh (two boys on the hockey team), Bug (little brother) and Hudson's mom all feel so real. None of them are caricatures and all have depth. -The season and place are captured so well. I've never been to upstate New York, but the exurbs of Buffalo and the miserable winter came alive for me. "W.W.H.D (What Would Hester Do)? I wonder. Then I totally laugh at myself, because Hester didn't have it so hot, either, what with all the public scorn and sneaking around. Not to mention the fact that I'm seeking advice from a four-hundred-year-old fictional character about high school boys--never a good sign." "Attention, ladies and gentlemen, this is not a test. I repeat, this is not a test. This is a bona fide, break-the-glass cupcake emergency." I've loved all of Sarah Ockler's novels. Twenty Boy Summer made me cry and will likely be considered a YA classic at some point. Fixing Delilah warmed my heart. But Bittersweet impacted me on a personal level the most. Highly recommended.